The fourth stage of the KonMari Method is when you tackle komono, which is Japanese for “miscellaneous items.” Ideally, you’ve sorted through your clothes, weeded your books, and gone through your papers. You’re not ready for your sentimental items yet, but now it’s time to tackle Everything Else. But that’s a lot of stuff. And with that, I took on the kitchen. Let’s start with the results. I did the main kitchen purge on July 4, and then went to CONvergence two days later. When I got back, I was a bit pressed for time, so I didn’t do major cooking. I just threw together a few ingredients and called it lunch for the following week. So it was almost two weeks before I did serious cooking in my newly-weeded kitchen. I opened the kitchen gadget drawer to get a strainer and was totally stunned by how easy it was to retrieve it. That drawer used to be so jam-packed that stuff would catch on the drawer above it and I’d have to work my hand in through a narrow opening and try to unsnag everything. Now opening the drawer was effortless and since the things in it were only one layer deep, I could easily see everything at a glance. This was so noticeable an improvement that it lifted my mood for the next half hour. So yes, totally worth the time spent pulling the kitchen equipment together and going through it! I started with the equipment I rarely use nowadays. I don’t use large skillets any longer, now that I have a sauté pan that I like, and anyway, the 12″ (30 cm) cast iron skillet was too heavy for me to handle safely. Eating habits have changed, and while I still adore layer cake with buttercream frosting, I rarely make it anymore, not even to take it into work for parties. I didn’t get rid of all the cake pans, but I tried to hold on to only the basics and only the specialty ones I fully expect to use within the next year. I need two 9″ round pans to make a layer cake, but I don’t need two Bundt pans when you only use one for a recipe. And it was time to accept that even if it improves the flavor noticeably, I’m not going to grind my own spices. Not enough to justify giving space to a spice grinder, anyway. I do grate fresh nutmeg, but I can use the grater for other things. The spice grinder was single-purpose and a lot larger. If I couldn’t identify the item or it looked too dangerous to use, it went. Rationally or not, I’m convinced that the onion holder was a tetanus shot waiting to happen, not so much when it was in use but when I was washing it afterwards. My wariness of sharp blades and points is why a mandoline slicer has never made it into my kitchen. One of the reasons I prefer baking to cooking is that you don’t need to use knives nearly as much in baking. It took me half an hour to remember what this blue thing was (you use it to protect your fingers while slicing or grating food). Often, one thing led to another. I’ve moved a pair of pie plates—not sure why I had two of them in the first place—from one apartment to another for years. Never mind that I haven’t made a pie in at least 12 years. So the pie plates went. And if I’m not making pies, then I don’t need to keep a pie keeper/carrier. Nor do I need pie weights, nor do I need a pie crust shield. Gone, gone, gone. I did keep the rolling pin—if it’s been at least 12 years since I made a pie, it has to be closer to 20 since I made pie crust from scratch—but that’s because I use it occasionally to crush cookies and the like into crumbs. I got rid of most of the “cute” equipment. I think there’s a perception that if you’re single, you need smaller quantities of food, like casseroles with only 2 servings. But here’s the catch: it takes almost as long to make a small amount of something as a regular amount. Think about it: why would it take twice as long to dip a 1-cup measure into flour and level it than it does to dip a ½-cup measure? So while I kept the bread maker that makes small loaves because they’re good for potlucks, I got rid of the tiny baking pans and other pots and pans that were only large enough for one or two servings. I like to bake, but I don’t like to cook all that much, so I prefer to cook regular size amounts and eat away at it over a week. It helps that I have a really high tolerance for leftovers. It’s hard to get rid of anything when there’s a little voice whispering But everyone needs a skillet. How can you not own a pie plate? But what if you want to make waffles some day? I had more trouble with the “what ifs” with kitchen equipment than with the other things. I have a lot of specialized kitchen equipment. If I got rid of the waffle maker, I couldn’t easily substitute something else if I decided I wanted a waffle one morning. Whereas with the clothes, if I gave away one shirt too many, all that meant was that I couldn’t wear that shirt, not that I’d have to go to work naked. And that’s why I still have the waffle maker, at least for now. 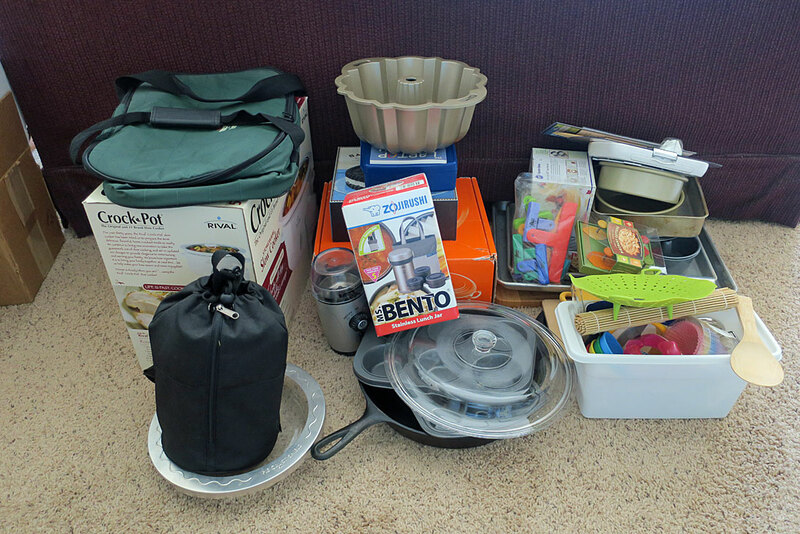 End result: about 80 pounds (36 kg) of kitchen stuff went off to Goodwill or to interested friends. Oh, my hypothetical future movers, you don’t know how I’m making your lives easier. I started with the kitchen equipment because of all the komono, I figured I had the least sentimental attachment to it. Which was technically true, but there were feelings anyway. With much of the stuff I’ve gotten rid of, it’s because I’ve outgrown it, like weeding most of my books on Wicca because I’m no longer Wiccan and because I’ve learned much of what was in the books and don’t need to refer to them as often. But I still like to bake. (Cooking, not so much.) Some of the baking equipment went because it was reminding me that I don’t get to bake as much as I used to, and the reminders were kind of sad. Am I still a baker if I don’t bake all that much? Is it all right to bake when most of the baked goods I like to make are on one naughty-no-no list or another? Will I bake much in the future? I catch myself scheduling my favorite recipes to make sure I cover as many of them as possible: vanilla pound cake for a potluck later this week, something easy to carry for the family reunion next month, chai-spiced pound cake or maple cake for a potluck in September, and definitely gingerbread and Grandma’s pumpkin bread for sometime this fall. But in trying to make sure all the favorites get covered, there are fewer chances to discover anything new, and I enjoy that as well. Melancholy aside, remember those great results I got with just the kitchen gadget drawer. And I no longer have to offload every baking pan I own onto the floor just to get to my 9″ x 13″ pan (22 x 33 cm). I’m sure I’m not conveying how thrilled this makes me, but I’m downright ecstatic every time I go into a manageable cupboard or drawer and easily retrieve something. I’m definitely pressing on with the KonMari Project. I don’t know what I’ll be dealing with next, but I continue to inch ahead. More later!